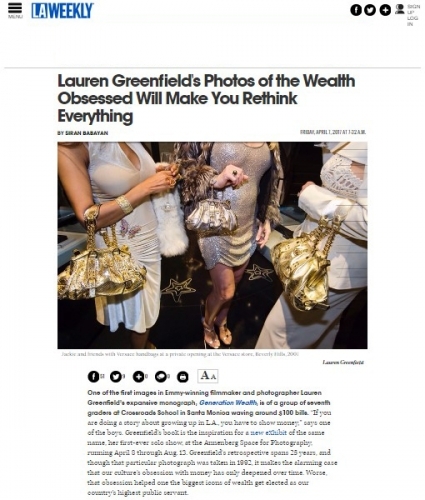 One of the first images in Emmy-winning filmmaker and photographer Lauren Greenfield’s expansive monograph, Generation Wealth, is of a group of seventh graders at Crossroads School in Santa Monica waving around $100 bills. “If you are doing a story about growing up in L.A., you have to show money,” says one of the boys. Greenfield’s book is the inspiration for a new exhibit of the same name, her first-ever solo show, at the Annenberg Space for Photography, running April 8 through Aug. 13. Greenfield's retrospective spans 25 years, and though that particular photograph was taken in 1992, it makes the alarming case that our culture’s obsession with money has only deepened over time. Worse, that obsession helped one the biggest icons of wealth get elected as our country’s highest public servant.